Paolo Mejia Fine Arts and Design cordially invites everyone to “Remnants,” an upcoming solo art show at our Oakland Annex facility in Jack London Square. 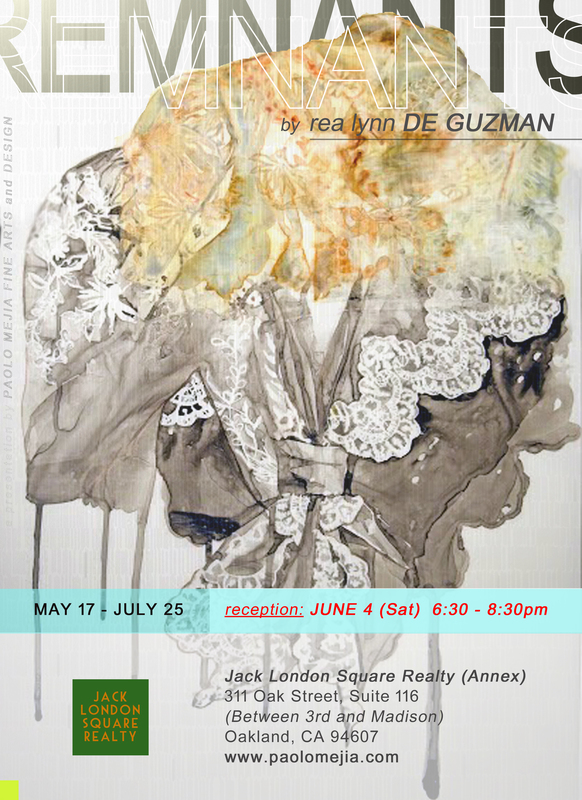 Featured works by San Francisco-based artist Rea Lynn de Guzman, whose work explores psychological and socio-political themes surrounding liminal identity, cultural assimilation, and the Filipino/a diaspora, tempered by her experience as a Filipina immigrant living in the United States. In this series of work, de Guzman references the iconography of “Maria Clara” (a mestiza character from Jose Rizal’s novel “Noli me Tangere” and metonym for a traditional dress woven from piña fiber and organza). Influenced by Spanish colonization, “Maria Clara” embodies Philippine ideals of female beauty equated with light skin, accompanied by stereotypes of chastity and demureness. Through the process of repetitive layering and a palette evoking skin tones, de Guzman utilizes the tactility of specific materials such as image transfers on synthetic organza to extract and repudiate these imposed ideals and stereotypes—material remnants intertwined with cultural legacies. Her work exemplifies complexity and historicity of the Filipino Culture. Come pass by our annex facility in Jack London Square area and see our guest artist for the the months of May through July.